Why do you choose to volunteer with HRRV? I worked as a nurse for 41 years, the last nine years in nursing homes, where I believe God gave me a love for the elderly. 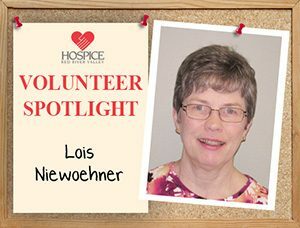 After I retired, being a hospice volunteer has given me the opportunity to visit and spend time with the elderly—something I didn’t have time to do when I was working. I’ve had several delightful patients with one woman in particular standing out. She was a dear woman with advanced dementia, and she hardly spoke a word. She was in a nursing home, and we spent our time in the dining room listening to music or the TV. Occasionally, she would look at me, and maybe I would get an answer to a question I asked, but mostly she was silent and didn’t seem to pay much attention to me. After several months of visits with her, she greeted me one day with a smile and “hello.” It was a heart warming moment. It only happened once, but it meant a lot to me. I have always loved dolls, and I have an enjoyable collection of old dolls from the 1920-1950s. I also enjoy playing the piano. I love playing scrabble, and I always find a little time for Sudoku as well.